Lemmings is a puzzle-platformer video game originally developed by DMA Design in Dundee, Scotland and published by Psygnosis for the Amiga in 1991 and later ported for numerous other platforms. The game was programmed by Mike Dailly and David Jones, and was inspired by a simple animation that Dailly created while experimenting with Deluxe Paint. Lemmings was one of the best-received video games of the early 1990s. It was the second-highest rated game in the history of Amstrad Action, and was considered the eighth-greatest game of all time by Next Generation in 1996. Lemmings is also one of the most widely ported and best-selling video games, and is estimated to have sold around 20 million copies between its various ports. The popularity of the game also led to the creation of several sequels, remakes and spin-offs, and has also inspired similar games. Lemmings is divided into a number of levels, grouped into four difficulty categories. Each level begins with one or more trap doors opening from above, releasing a steady line of lemmings who all follow each other. Levels include a variety of obstacles that prevent lemmings from reaching the exit, such as large drops, booby traps and pools of lava. The goal is to guide at least a certain percentage of the green-haired, blue-robed lemmings from the entrance to the exit by clearing or creating a safe passage through the landscape for the lemmings to use. Unless assigned a special task, each lemming will walk in one direction ignoring any other lemming in its way (except Blockers), falling off any edges and turning around if they hit an obstacle they cannot pass. A lemming can die in a number of ways: falling from a great height, falling into water or lava, disappearing off the top, bottom or side of the level map, being caught in a trap or fire, or being assigned the Bomber skill. Every level has a time limit; if the clock counts down to zero, the level automatically ends. To successfully complete the level, the player must assign specific skills to certain lemmings. Which skills and how many uses of each are available to the player varies from level to level, and the player must assign the skills carefully to successfully guide the lemmings. There are eight skills that can be assigned: Climbers climb vertically though fall down if they hit an overhang. Floaters use a parachute to fall safely from heights. Bombers explode after a five-second timer, destroying themselves and any destructible landscape in close proximity, though not damaging other lemmings or traps. Blockers stand still and prevent other lemmings from passing; lemmings that hit a Blocker simply reverse direction. Builders build a stairway of 12 steps. Bashers, Miners and Diggers dig horizontally, diagonally downwards or directly downwards respectively. While the player is able to pause the game to inspect the level and status of the lemmings, skills can only be assigned in real-time. Lemmings are initially released at a rate predetermined by the level (from 1 to 99). The player can increase the rate as desired to a maximum of 99, and later decrease it down to, but not lower than, the initial rate. The player also has the option to "nuke" all the remaining lemmings on the screen, converting them to Bombers. This option can be used to abort a level when in a no-win situation, remove any Blockers that remain after the remaining lemmings have been rescued, or end a level quickly once the required percentage of saved lemmings has been reached. The four difficulty groups – "Fun", "Tricky", "Taxing" and "Mayhem" – are used to organise the levels to reflect their overall difficulty. This rating reflects several factors, including the number of obstacles the player has to surpass, the limitation on the number of types of skills available to assign, the time limit, the minimum rate of lemming release, and the percentage of lemmings that must be saved. Some versions have additional difficulty ratings with more levels in each. In two-player mode, each player can only control lemmings of their own colour but attempt to guide any lemming to their own goal. The original Lemmings also has 20 two-player levels. This took advantage of the Amiga's ability to support two mice simultaneously, and the Atari's ability to support a mouse and a joystick simultaneously. 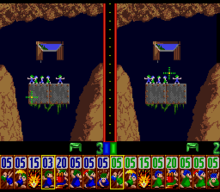 Each player is presented with their own view of the same map (on a vertically split screen), can only give orders to their own lemmings (green or blue), and had their own base. The goal is to get more lemmings (regardless of colour) into one's own base than the other player. Gameplay cycles through the 20 levels until neither player gets any lemmings home. Mike Dailly, the first employee of DMA Design and one of the programmers for Lemmings, provided a detailed history of the development of the game entitled "The Lemmings Story" in 2006. David Jones, founder of DMA Design, has also commented on the development and success of Lemmings. The original Lemmings walk-cycle sprite animations from Mike Dailly (left) and Gary Timmons' improved version on the right. The animation was done using an 8×10 pixel space, with Timmons' version showing a less stiff walk cycle. The animation has eight frames and takes 0.8 seconds to complete one cycle. The inspiration for gameplay came as a result of a simple animated character sprite in an 8×8 pixel box created by Dailly using Deluxe Paint as part of development for Walker, then envisioned as a sequel to Blood Money. Dailly was able to quickly produce an animated graphic showing his creations moving endlessly, with additional graphical improvements made by Gary Timmons and other members of the DMA Design team to help remove the stiffness in the animation. One member, Russell Kay, observed that "There's a game in that! ", and later coined the term "lemmings" for these creations, according to Dailly. Allowing the creatures to move across the landscape was based on a Salamander weapon concept for Blood Money and demonstrated with the animations. Levels were designed based on a Deluxe Paint interface, which allowed several of the members to design levels, resulting in "hundreds of levels". There were several internal iterations of the levels, each designer challenging the others. Dailly pointed out that David Jones "used to try and beat us, and after proudly stabbing a finger at the screen and saying 'There! Beat that! ', we'd calmly point out a totally new way of getting around all his traps, and doing it in a much simpler method. 'Oh...', he'd mutter, and scramble off to try and fix it." They also sent internally tested levels to Psygnosis, getting back the results of their testing via fax. While most were solved quickly, Dailly commented that "Every now and again though, the fax would be covered in scribbles with the time and comments crossed out again and again; this is what we were striving for while we were designing the levels, and it gave us all a warm fuzzy feeling inside." Each of the designers had a somewhat different style in their levels: Dailly's levels often had titles containing clues to what to do (such as "It's Hero Time", suggesting that one lemming had to be separated from the crowd) and generally required the player to perform several actions at once; Gary Timmons's levels were minimalistic, with popular culture references in the titles, and Scott Johnston's (whose mother was the first voice of the lemmings) levels were generally tightly packed. Dailly was also responsible for the "custom" levels based on other Psygnosis and Reflections Interactive Amiga games, including Shadow of the Beast, Menace, Awesome and Shadow of the Beast II. These "crossover" levels also used music from those games, though in ports these levels have been removed or altered to remove such references. After they developed most of the hard levels, they then created several simple levels either by copying the existing ones or creating new layouts; as Dailly states, "This I believe is where many games fall down today, they do not spend the time making a good learning curve." Timmons is credited with the official drawings of the lemmings, as necessitated by the need of Psygnosis for box cover artwork. Music was originally created by Brian Johnston (Scott's younger brother), who sampled bits of copyrighted music. This had been common practice, but at that point there was a growing awareness of music copyright. Psygnosis asked Tim Wright to replace the offending tracks, who often used arrangements and reworkings of classical and traditional music to avoid copyright problems. Music tracks in the game include: "Galop Infernal" from Orpheus in the Underworld (the music by Offenbach often used for the can-can), "Rondo alla Turca" from Mozart's Piano Sonata No. 11, "Dance of the Reed Flutes" from Tchaikovsky's Nutcracker Suite, "Dance of the Little Swans" from Tchaikovsky's Swan Lake, "Ten Lemmings" (a track that uses melodies from traditional song "Ten Green Bottles", Chopin's Piano Sonata No. 2 (the part used as funeral march), Wagner's "Bridal Chorus" (popularly known as "Here Comes the Bride")), "London Bridge is Falling Down", the English folk tune "Forest Green" (adapted into the hymn "All Beautiful the March of Days"), the carol "O Little Town of Bethlehem" mixed with the melody from the film The Good, the Bad and the Ugly, "She'll Be Coming 'Round the Mountain", and "(How Much Is) That Doggie in the Window?". The two-player option was inspired by then-current games Populous and Stunt Car Racer. DMA Design initially wanted to use a null-modem connection between two machines to allow competitive play, but ended up using the ability of the Amiga to have two mouse pointer devices usable at the same time and thus created the split-screen mode. The popularity of the game on the Amiga led to its rapid porting to many other platforms, and it is regarded as one of the most widely ported video games. Within a year of its release, the game had been ported to Atari ST, Sinclair Spectrum, PC and SNES. David Jones stated that after porting the game to 20 systems, he stopped keeping count of additional ports. Other commercial ports of the original game include 3DO, Acorn Archimedes, Apple IIgs, Apple Macintosh, CDTV, Commodore 64, NES, Sega Master System and Genesis, TurboGrafx-16, Philips CD-i and Sharp X68000. The license to the Lemmings intellectual property had remained with Psygnosis, which became part of Sony Computer Entertainment in 1993 but ultimately folded in 2012, leaving Lemmings as a Sony property. Sony has used that to craft more modern remakes. In early 2006, Sony released a remake of Lemmings for the PlayStation Portable, developed by Team17. It features all 120 levels from the original game, 36 brand-new levels as well as DataPack support (similar to the Extra Track system featured in Wipeout Pure), and a user-level editor. Every level in the game is a pre-rendered 3D landscape, although their gameplay is still 2D and remains faithful to the original game. User levels can be constructed from pre-rendered objects and distributed by uploading them to a PlayStation-specific Lemmings online community. The soundtrack also marks the final video game score created by longtime composer Tim Follin after he announced his retirement from the industry in mid-2005. In October 2006 the game was ported by developer Rusty Nutz for the PlayStation 2 with use of the EyeToy. The basic change in the concept is that the player must stretch and use his/her limbs in the recorded picture to aid the lemmings. In 2007, Team17 produced a similar remake of Lemmings for the PlayStation 3 for download through the PlayStation Network. The game has the similar graphical improvements as the PSP title, as well as on-line scoreboards and additional levels developed for high-definition display, but lacks the ability to create and share levels as the PSP version offers. Another remake, Lemmings Touch, was released for PlayStation Vita on 27 May 2014, developed by d3t Ltd. Sony studio Sad Puppy released a mobile-friendly version of Lemmings for iOS and Android in December 2018. Screenshot of Oh No! More Lemmings for the SAM Coupé home computer. Lemmings received some expansion packs following its launch. Oh No! 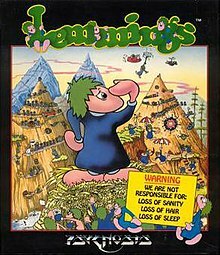 More Lemmings, originally released for the Amiga in 1991 both as a data disk or standalone game, added five varying difficulties—Tame, Crazy, Wild, Wicked and Havoc—each with 20 new levels. The game also features enhanced graphics and altered sound effects. The expansion was also ported to Acorn Archimedes, Atari ST, DOS, Macintosh, and Sam Coupé, and the levels were made available with the Game Boy Color, Microsoft Windows, PlayStation and Sega Genesis versions of Lemmings. Oh No! More Lemmings received generally positive reviews. Dan Slingsby of CU Amiga found the game addictive, calling the puzzles "ingenious", and Peter Lee of Amiga Action praised the quality and difficulty of the levels; Stuart Campbell of Amiga Power was disappointed by the lack of fixes from the original game, and Ed Ricketts of ST Format criticised the difficulty gradient of the levels and the price of the expansion, but both ultimately gave positive reviews nonetheless. Christmas Lemmings, also known as Holiday Lemmings, was also released as a series of short games released between 1991 and 1994. The gameplay remains unchanged from the base game, which is not required. 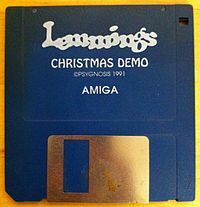 First released as Xmas Lemmings as two four-level demos in 1991 and 1992, there were two later full retail releases on the Amiga and Atari ST in 1993 and 1994, both with an additional 32 levels. The games were well-received; Rob Mead of Amiga Format described it as "funny, frustrating and incredibly addictive", despite being disappointed by the number of levels, and Will Greenwald of PC Magazine ranked it among the best Christmas video games in 2014. The original sales for Lemmings on the Amiga topped 55,000 copies on the first day of sales; in comparison, Menace sold 20,000 copies and Blood Money sold 40,000 copies cumulatively. With all the ports included, Mike Daily estimated that 15 million copies of Lemmings were sold between 1991 and 2006. In 2017, Luke Plunkett from Kotaku placed the figure at over 20 million, a figure which has been quoted as far back as 1997. At the time of its first release, Lemmings received several high scores from gaming magazines, with only the level of graphics and sound receiving some small amount of criticism. David Sears of Compute!, in his review of Lemmings for the PC, stated that "perhaps Psygnosis has tapped into the human instinct for survival in formulating this perfect blend of puzzle, strategy, and action." Amiga Computing stated that "Lemmings is absolutely brilliant. Psygnosis have managed to produce a game that is not only totally original, but also features the kind of addicting gameplay that will keep the player coming back for more time and time again." A review from the Australian Commodore and Amiga Review (ACAR) stated that "above all, the concept is simple, and the game is a lot of fun." Computer Gaming World stated that "Not since Tetris has this reviewer been so addicted to, or completely fascinated with, a series of challenging puzzles ... follow the crowd and get Lemmings". In 1992 the magazine named it its Action Game of the Year. The game was reviewed in 1991 in Dragon by Hartley, Patricia, and Kirk Lesser in "The Role of Computers" column. The reviewers gave the game 5 out of 5 stars. The Lessers reviewed the Macintosh version of the game in 1993 in Dragon, also giving that version 5 stars. In 1994 Electronic Gaming Monthly complimented the Lynx version's large number of options and password feature, and remarked, "Lemmings has always been a good strategy game, and the Lynx version continues the tradition." The following year they reviewed the CD-i version, criticising that it has nothing but the obligatory full-motion video intro to set it apart from the numerous ports of the game that had already been released over the past four years. GamePro made the same criticisms, commenting that "this former 16-bit puzzler isn't going anywhere new on the CD-i." Next Generation's review of the 3DO version assessed that "If you've played any version, you've played this one, too, but if you haven't tried it, this is one of the better ones, and it's still one game that's addictive as hell." In 1996, Computer Gaming World declared Lemmings the 12th-best computer game ever released, and that same year, Next Generation declared it the 8th-greatest game of all time, and "second only to Tetris" in the puzzle genre. In 2004, readers of Retro Gamer voted Lemmings as the 21st-top retro game, with the editors calling it "perhaps Psygnosis' finest hour and a turning point in the puzzle genre." In 1991, PC Format named Lemmings one of the 50 best computer games ever. The editors wrote, "Yes, we know it sounds stupid, but you will like it — everyone else has." In 1994, PC Gamer US named Lemmings the 30th best computer game ever. The editors called it "one of the biggest puzzlers ever released for PC" and "cleaner and less complicated" than its sequel. That same year, PC Gamer UK named it the 25th best computer game of all time, calling it "a seminal title." In 1998, PC Gamer declared it the 21st-best computer game ever released, and the editors called it "as fresh and addictive today as it was when it was first released". Lemmings inspired several sequels, including the Christmas Lemmings short games that were released between 1991 and 1994, and the 1991 expansion Oh No! More Lemmings. Stand-alone sequels were Lemmings 2: The Tribes (1993), All New World of Lemmings (1994), 3D Lemmings (1995) and Lemmings Revolution (2000). By mid-1995, Lemmings and its sequels had accumulated combined sales of more than 4 million units worldwide. Two spin-off games were also made, both in 1996; Lemmings Paintball and The Adventures of Lomax. Numerous clones of Lemmings were made. One of the first was The Humans, released for the Amiga in 1992. General game concepts have been included in the open source Pingus, where the player is required to safely guide penguins across landscapes using a similar array of tools. Other similar games include Clones. Yannick LeJacq of Kotaku, commenting on the 2014 game MouseCraft which incorporates elements of Lemmings and Tetris, speculated that games like Lemmings would not be very successful in the current gaming market, as the pace of the game is far too slow to satisfy most players. In 2004, Graham Cormode proved that deciding whether it is possible to complete a level of Lemmings is NP-hard. Later, Giovanni Viglietta showed that the task is PSPACE-complete, even for levels where there is only one lemming to save. In 2010, it was announced that Lemmings would be ported to the iOS operating system by developer Mobile 1UP. On 29 June 2010, Mobile 1UP reported that Sony Computer Entertainment Europe had presented them with a cease-and-desist letter, forcing them to halt development of the port. In April 2011, Mobile 1UP has released a re-worked version of the work done in 2010 with a prehistoric setting (new artwork, sfx, music, levels) under the name Caveman, available for the iOS and webOS platforms. Brutal Deluxe, the developer who did the porting of the Apple IIgs version of Lemmings, has released the games' source code. Lemmings has also been called a predecessor of the modern real-time strategy (RTS) video game genre. A 1991 Amiga Power article claimed that Lemmings "was the first major game to introduce the 'indirect-control' concept," an element that is now common in many RTS games. Blizzard Entertainment developer Bob Fitch said that part of the inspiration for the first Warcraft game, Warcraft: Orcs & Humans, was based on developing a competitive multiplayer RTS that combined elements of The Lost Vikings (which he had worked on) and Lemmings; Fitch said "We just went, 'Oh it's so cool when you see lots of Lemmings all over the place. Why don't we have lots of Vikings all over instead, and then the Vikings can fight each other." Lemmings' introduction of RTS elements has been noted by fantasy author Terry Pratchett; in his novel Interesting Times, an army of golems is controlled in a fashion reminiscent of the Lemmings user interface. When readers asked if this was deliberate, Pratchett responded: "Merely because the red army can fight, dig, march and climb and is controlled by little icons? Can't imagine how anyone thought that... Not only did I wipe Lemmings from my hard disk, I overwrote it so I couldn't get it back." ^ "Psygnosis". Box Equals Art. Retrieved 25 December 2017. ^ "The Release Schedule". Computer Trade Weekly. No. 323. United Kingdom. 11 February 1991. p. 14. ^ "The Release Schedule". Computer Trade Weekly. No. 399. United Kingdom. 10 August 1992. p. 15. ^ a b c d "Crash issue 94 page 15". World of Spectrum. Crash. Retrieved 10 December 2014. ^ a b c d Fox, Matt (3 January 2013). The Video Games Guide: 1,000+ Arcade, Console and Computer Games, 1962-2012, 2d ed. McFarland & Company. p. 169. ISBN 978-0786472574. Archived from the original on 2 April 2015. ^ a b "Lemmings". Your Sinclair. Archived from the original on 5 May 2013. Retrieved 10 December 2014. ^ a b c d Atari, ed. (1993). Lemmings Instruction Manual (Atari Lynx) (C398105-080 Rev. A). Atari. pp. 5–7. ^ a b c Bramwell, Tom (7 March 2006). "Lemmings". Eurogamer. Archived from the original on 21 February 2013. Retrieved 10 December 2014. ^ Herold, Charles (29 June 2006). "Addictive as Chips, but Less Fattening". The New York Times. Archived from the original on 30 January 2013. Retrieved 10 December 2014. ^ a b Cocker, Guy (1 June 2006). "Lemmings Review". GameSpot. Archived from the original on 10 December 2014. Retrieved 10 December 2014. ^ a b c d e f g h i Dailly, Mike (2006). "The Complete History of Lemmings". The Complete History of Lemmings. Archived from the original on 27 June 2015. Retrieved 10 December 2014. ^ a b c d e f g Wallis, Alistair (21 December 2006). "Playing Catch Up: GTA/Lemmings' Dave Jones". Gamasutra. Archived from the original on 26 May 2012. Retrieved 10 December 2014. ^ Lee, Don (15 June 2006). "Lemmings PSP Review". Consumer Electronics Net. Archived from the original on 10 December 2014. Retrieved 10 December 2014. ^ Purchase, Robert (20 December 2018). "Sony's just released a new Lemmings game for mobile". Eurogamer. Retrieved 20 December 2018. ^ "Lemmings - PlayStation Portable - IGN". IGN. 24 April 2006. Archived from the original on 27 February 2017. Retrieved 10 December 2014. ^ Cifaldi, Frank (26 September 2005). "Playing Catch-Up: Tim Follin". Gamasutra. Archived from the original on 8 May 2011. Retrieved 10 December 2014. ^ "Lemmings: PS2". IGN. Archived from the original on 24 January 2015. Retrieved 23 January 2015. ^ "Nix" (12 May 2006). "E3 2006: Lemmings". IGN. Archived from the original on 27 February 2017. Retrieved 10 December 2014. ^ Van Ord, Kevin (19 January 2007). "Lemmings for PlayStation 3 Review". GameSpot. Archived from the original on 10 December 2014. Retrieved 10 December 2014. ^ "Lemmings Touch – IP Reboot and HD Remake". D3T Ltd. Archived from the original on 27 February 2017. Retrieved 26 October 2016. ^ Hansen, Serken (20 December 2018). "Lemmings comes to mobile devices today". PlayStation Blog. Retrieved 20 December 2018. ^ a b Slingsby, Dan (February 1992). James, Steve (ed.). "Oh No! More Lemmings". CU Amiga. EMAP: 69–70. ^ a b Ricketts, Ed (March 1992). Peers, Nick (ed.). "Oh No! More Lemmings". ST Format. Future plc (32): 88. ^ Perry, Douglass (6 October 1998). "Lemmings and Oh No! More Lemmings". IGN. Ziff Davis. Archived from the original on 20 April 2016. Retrieved 10 April 2016. ^ Lee, Peter (February 1992). White, Steve (ed.). "Oh No! More Lemmings". Amiga Action. International Data Group (29): 34. ^ Campbell, Stuart (January 1992). Bielby, Matt (ed.). "Oh No! More Lemmings". Amiga Power. Future plc (9): 34–35. ^ "The 12 Days of Last Christmas". Eurogamer. Gamer Network. 21 December 2007. Archived from the original on 9 April 2016. Retrieved 10 April 2016. ^ Mead, Ed (January 1994). Dyson, Marcus (ed.). "Holiday Lemmings". Amiga Format. Future plc (55): 101. ^ Greenwald, Will (24 December 2014). "The Best Christmas Video Games Ever". PC Magazine. Ziff Davis. Archived from the original on 9 April 2016. Retrieved 10 April 2016. ^ "Lemmings for Super Nintendo". GameRankings. CBS Interactive. Retrieved 26 December 2018. ^ a b "Amstrad Action All Time Top 10 Games". Retroaction. 8 September 2010. Archived from the original on 16 December 2012. Retrieved 10 December 2014. ^ a b "Review Crew: Lemmings". Electronic Gaming Monthly (56). EGM Media, LLC. March 1994. p. 42. ^ a b "Lemmings Review". Electronic Gaming Monthly (69). EGM Media, LLC. April 1995. p. 40. ^ Robert A. Jung (6 July 1999). "Woohoo! Look at them little lemmings walk..." IGN Entertainment. Retrieved 12 August 2018. ^ a b "Lemmings". Next Generation. Imagine Media (3): 88. March 1995. ^ "Amiga Power's All-Time Top 100 Amiga Games". Amiga Power (0): 5. May 1991. Archived from the original on 9 April 2016. Retrieved 23 December 2014. ^ "150 Best Games of All Time". CDAccess. Archived from the original on 24 July 2012. Retrieved 10 December 2014. ^ "Edge's Top 100 Games of All time". Edge. 2 July 2007. Archived from the original on 21 January 2013. Retrieved 10 December 2014. ^ "30 najlepszych gier na Amigę". Wirtualnej Polsce (in Polish). Archived from the original on 16 April 2013. Retrieved 10 December 2014. ^ a b "Top 100 Games of all Time". Next Generation (21): 68. September 1996. Retrieved 23 December 2014. ^ Dailly, Mike (2006). "The Complete History of DMA Design". Mike Dailly. Archived from the original on 29 June 2012. Retrieved 10 December 2014. ^ Plunkett, Luke (12 August 2011). "What do Grand Theft Auto and Lemmings Have In Common?". Kotaku. Gawker Media. Archived from the original on 27 April 2017. Retrieved 26 April 2017. ^ "NG Alphas: Gamespotting". Next Generation. No. 28. Imagine Media. April 1997. p. 98. ^ Sears, David (October 1991). "Lemmings". Compute!. p. 106. Archived from the original on 31 July 2012. Retrieved 10 December 2014. ^ Holborne, Jason (May 1991). "Lemmings". Amiga Computing. pp. 52–53. ^ Cambell, Phil (April 1991). "Lemmings". ACAR. p. 76. ^ Greenberg, Allen L. (June 1991). "Another Leap Forward". Computer Gaming World. p. 56. Archived from the original on 3 December 2013. Retrieved 10 December 2014. ^ "CGW Salutes The Games of the Year". Computer Gaming World. November 1992. p. 110. Archived from the original on 2 July 2014. Retrieved 10 December 2014. ^ Lesser, Hartley; Lesser, Patricia; Lesser, Kirk (July 1991). "The Role of Computers". Dragon (171): 57–64. ^ Lesser, Hartley; Lesser, Patricia; Lesser, Kirk (May 1993). "The Role of Computers". Dragon (193): 57–63. ^ "ProReview: Lemmings". GamePro. IDG (70): 92. May 1995. ^ Staff (November 1996). "150 Best (and 50 Worst) Games of All Time". Computer Gaming World (148): 65. ^ Retro Gamer 9, page 57. ^ "Lemmings 2: The Tribes - PC - IGN". IGN. 16 August 2013. Archived from the original on 27 February 2017. Retrieved 10 December 2014. ^ a b Soete, Tim (23 August 1996). "Lemmings Paintball Review". GameSpot. Archived from the original on 17 March 2012. Retrieved 26 January 2015. ^ "75 Power Players". Next Generation. Imagine Media (11): 68. November 1995. ^ Sterbakov, Hugh (1 December 1996). "Adventures of Lomax Review". GameSpot. Archived from the original on 26 January 2015. Retrieved 26 January 2015. ^ Anderson, Lee (20 December 2000). "Top 10 Linux games for the holidays". CNN. Archived from the original on 1 February 2011. Retrieved 10 December 2014. ^ Zimmerman, Conrad (20 March 2009). "Preview: Clones". Destructoid. Archived from the original on 28 July 2012. Retrieved 26 January 2015. ^ LeJacq, Yannick (9 July 2014). "Now I Know Why Lemmings Died". Kotaku. Archived from the original on 9 July 2014. Retrieved 10 December 2014. ^ Cormode, Graham (2004). "The hardness of the Lemmings game, or Oh no, more NP-completeness proofs" (PDF). In Proceedings of the 3rd International Conference on Fun with Algorithms: 65–76. Archived (PDF) from the original on 30 July 2016. ^ Viglietta, Giovanni (2015). "Lemmings Is PSPACE-Complete" (PDF). Theoretical Computer Science. 586: 120–134. arXiv:1202.6581. doi:10.1016/j.tcs.2015.01.055. Archived (PDF) from the original on 12 August 2016. ^ Bell, Killian (25 June 2010). "Lemmings Coming to iPhone and iPod Touch For Free!". Cult of Mac. Archived from the original on 24 July 2012. Retrieved 10 December 2014. ^ Glasser, AJ (1 July 2010). "Lemmings iPhone port slapped with cease-and-desist letter". Macworld. Archived from the original on 28 January 2013. Retrieved 10 December 2014. ^ Caplan, Lisa (13 April 2011). "If It Walks Like A Lemming And Talks Like A Lemming It Must Be… Caveman?". AppAdvice. Archived from the original on 7 July 2012. Retrieved 10 December 2014. ^ "Download the complete source code of the award-winning game from Psygnosis". Brutal Deluxe. Archived from the original on 25 July 2015. Retrieved 7 October 2015. ^ "Buyers Guide". Amiga Power (8): 111–112. December 1991. Archived from the original on 13 March 2016. Retrieved 25 December 2014. ^ Bailey, Kat (15 August 2017). "WarCraft Was Originally Conceived in Part as "Lost Vikings Meets RTS"... And Lemmings". US Gamer. Archived from the original on 6 September 2017. Retrieved 6 September 2017. ^ Breebaart, Leo (1 July 2005). "Annotated Pratchett File v 9.0 - Interesting Times". LSpace. Archived from the original on 4 August 2012. Retrieved 10 December 2014.